Ashton-Tate of dBASE® fame used to call them anomalies. Sheer arrogance kept them from ever quite admitting there was an actual bug in their software. We don’t claim to be quite so perfect. If you use any software for very long, you’re going to encounter bugs. But not all reported problems turn out to be bugs. Many turn out to be errors generated by users that don’t quite know what they’re doing because they never bothered to RTFM. Whether they’re bugs or self-inflicted wounds, the result is still pretty much the same. The code doesn’t work as advertised. As part of our Back to School series, today we’re going to introduce you to a methodology to keep your Asterisk® server running smoothly… warts and all. That process begins by your clicking the Getting Started Guide at the top of the Nerd Vittles page, identifying your particular platform, and reading the applicable tutorial from front to back. About nine times out of ten, that will tell you whether you’ve encountered a bug or just a feature that you haven’t quite mastered. 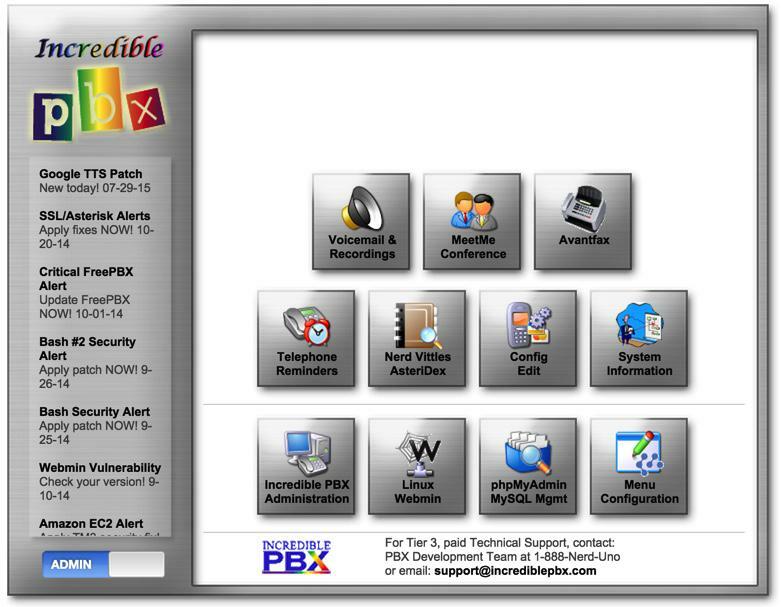 Unlike the other Asterisk aggregations, Incredible PBX™ includes an Automatic Update Utility. It gets run whenever you log into your server as root and is there primarily to address security issues. Depending upon the severity of the bug, we address some non-security related bugs as well. The problem from our perspective is that we’re dealing with a moving target with almost a dozen different versions and platforms. On each of those platforms, there are literally hundreds of software applications that are maintained and "improved" by various developers around the world. Sometimes things break. The other fact of life is there are only so many hours in the day and about 95% of all users of open source software never contribute a dime toward any open source project. Translation: We depend upon volunteers rather than paid staff to report and fix our bugs and those of other projects upon which we depend. We’re happy to provide the latest software with the latest bug fixes at no cost. The rest is pretty much up to you. If the bugs in your current version become intolerable, then install a newer release and chances are that most of the problems will have been resolved. Yes, you will have to manually reconfigure your extensions and trunks and routes, but everything else will pretty much be the same. That’s the only real cost of using free software. We want to identify the most common reported problems with Incredible PBX today and show you how to fix some of these issues yourself. After all, this is supposed to be a learning experience. And learning to fix things for yourself or at least knowing where to turn to get the answers is the best thing you can do to assure you have a stable platform for years to come. There are two terrific sources of information to keep your system current and stable. The first is the RSS Feeds for Asterisk, FreePBX®, and PBX in a Flash/Incredible PBX. The second is the Forums for these three platforms: Asterisk, FreePBX, and PBX in a Flash/Incredible PBX, especially the Bug Thread. If you’re going to use open source software, then you owe it to yourself and your server to check all of these sources at least once a week and address any new issues that have been identified. The downside of not heeding this advice is you are exposing your server to potential attacks that may compromise not only your server but the servers of others as well once your system has been transmogrified into a Zombie. There are four different passwords that cause problems for new users. On the Incredible PBX platform, these get set in different ways. The confusion typically arises when the user attempts to access a server resource and a password prompt appears. Fixing the problem depends upon which password is being requested. Be advised that more than two attempts to guess a password may get you locked out of your server for several hours because of Fail2Ban. Then you have two problems to contend with rather than one. Linux CLI Root Password. Regardless of the Linux platform, the root password gets set when you install the operating system. If you can’t log in as root from the server console, chances are pretty good that you’ve forgotten the password or typed it incorrectly. Fixing this problem is major surgery and often you will be better served by reinstalling your server. If you’d prefer to reset the password, then follow the steps in this Linux Gazette article. While it doesn’t apply to Incredible PBX builds, you may encounter a failed root login using SSH or Putty if the server has been configured to deny root SSH access or to require an SSH key to log in. This can be remedied by logging in from the console and reconfiguring the login parameters for either the CentOS/Scientific Linux or Ubuntu/Debian/Raspbian OS. The admin account and password are required to access phpMyAdmin and other administrator applications. WebMin GUI Access. WebMin is a tool for use by skilled Linux administrators only. You can seriously and irreparably damage your PBX by making changes within WebMin. You’ve been warned. To access WebMin on Incredible PBX servers, click on the icon in the Main Administrator Menu. Or you can access WebMin using https://ServerIPaddress:9001. The username must be root, and the password is your Linux root password. Identifying the Problem. 99% of the problems with delivery of emails with voicemail attachments from your server have little to do with your server. They are the result of one of two things. Either your email client has placed the incoming email messages in its SPAM or JUNK folder, or your Internet Service Provider (ISP) is blocking downstream SMTP mail servers from sending email. The ISPs claim this is a security precaution to reduce SPAM generated from compromised servers. Fixing the SPAM problem. If you find the test email message in your SPAM or JUNK folder, there are two ways to go about fixing the problem. The simplest is to mark the sending email address (whatever it happens to be in the email message) as NOT SPAM in your email client. For Gmail, simply create a filter for the email sender and specify "Never send it to SPAM" and "Mark it important." The alternative is to assign a Fully-Qualified Domain Name (FQDN) to your server. This could be done using a Dynamic DNS Server such as dyndns.org. Once you’ve set up your FQDN, this thread on the PIAF Forum will walk you through assignment of the FQDN to your server. Save the file and restart SendMail: service sendmail restart. If all else fails, Google is your friend. Finally, there’s one more configuration setting that should be checked. Because the Travelin’ Man 3 WhiteList feature allows you to enter either IP addresses or FQDNs, we need to be sure IPtables is started up after DNS services are enabled on your server, or IPtables startup will fail. By default on many servers, IPtables startup occurs first. That means a manual configuration change is required to be sure IPtables startup is successful. Issue the following command to display the custom startup for your CentOS server: cat /etc/rc.d/rc.local. On Ubuntu/Debian/Raspbian platforms, issue the command: cat /etc/rc.local. The results should include: /usr/local/sbin/iptables-restart. If not, add it before exit 0. For those using Incredible Fax, there are two main problems: not being able to log in to AvantFax and the dreaded "IAXmodem please wait" message once you get there. On the CentOS platform, the most important fix is making sure you’re using the latest Incredible Fax install script. If you’ve already encountered the problem on CentOS servers, just download the new script, tar zxvf incrediblefax11-centos*, and run the installer again. We know: you’re not supposed to. If that doesn’t address your problem and you’ve already reset your admin password as documented in section 1, see this PIAF Forum thread for some helpful hints. One of our most requested utilities is a script to notify administrators when a trunk goes off-line. Just issue the following commands to install it. Then edit /root/trunkcheck.sh and insert your email address. Works for SIP, IAX, and GV trunks. Don’t ask us why but on some servers Asterisk ends up running as the root user rather than the asterisk user. Given the current design of FreePBX which assigns almost all privileges to the asterisk user anyway, it’s more an academic problem than a real one. If an intruder gains asterisk user access to your server, your system is toast whether the intruder has root privileges or not. Identifying the Problem. To test whether the main Asterisk program is running as root, just issue the following command: ps aux | grep sbin/asterisk. If the first column of the first entry in the list shows root, then apply the fix. Identifying the Problem. Some users have reported a problem activating the various repository tabs within the GUI’s Module Admin component. Special thanks to Lorne Gaetz and Andrew Nagy for the fix.